The reason rhythm is such a powerful tool is that it permeates the entire brain. Vision for example is in one part of the brain, speech another, but drumming accesses the whole brain. The sound of drumming generates dynamic neuronal connections in all parts of the brain even where there is significant damage or impairment such as in Attention Deficit Disorder (ADD). 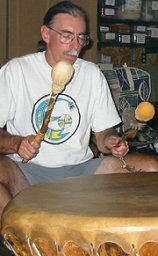 According to Michael Thaut, director of Colorado State University's Center for Biomedical Research in Music, "Rhythmic cues can help retrain the brain after a stroke or other neurological impairment, as with Parkinson's patients..." The more connections that can be made within the brain, the more integrated our experiences become. Rhythmic drumming induces altered states, which have a wide range of therapeutic applications. A recent study by Barry Quinn, Ph.D. demonstrates that even a brief drumming session can double alpha brain wave activity, dramatically reducing stress.5 The brain changes from Beta waves (focused concentration and activity) to Alpha waves (calm and relaxed), producing feelings of euphoria and well-being. Alpha activity is associated with meditation, shamanic trance, and integrative modes of consciousness. This ease of induction contrasts significantly with the long periods of isolation and practice required by most meditative disciplines before inducing significant effects. Rhythmic stimulation is a simple yet effective technique for affecting states of mind. Drumming can help people express and address emotional issues. Unexpressed feelings and emotions can form energy blockages. The physical stimulation of drumming removes blockages and produces emotional release. Sound vibrations resonate through every cell in the body, stimulating the release of negative cellular memories. "Drumming emphasizes self-expression, teaches how to rebuild emotional health, and addresses issues of violence and conflict through expression and integration of emotions," says Music educator Ed Mikenas. Drumming can also address the needs of addicted populations by helping them learn to deal with their emotions in a therapeutic way without the use of drugs. Drumming helps reconnect us to our core, enhancing our sense of empowerment and stimulating our creative expression. "The advantage of participating in a drumming group is that you develop an auditory feedback loop within yourself and among group members-a channel for self-expression and positive feedback-that is pre-verbal, emotion-based, and sound-mediated. "9 Each person in a drum circle is expressing themselves through his or her drum and listening to the other drums at the same time. "Everyone is speaking, everyone is heard, and each person's sound is an essential part of the whole. "10 Each person can drum out their feelings without saying a word, without having to reveal their issues. Group drumming complements traditional talk therapy methods. It provides a means of exploring and developing the inner self. It serves as a vehicle for personal transformation, consciousness expansion, and community building. The primitive drumming circle is emerging as a significant therapeutic tool in the modern technological age. 1. Bittman, M.D., Barry, Karl T. Bruhn, Christine Stevens, MSW, MT-BC, James Westengard, Paul O Umbach, MA, "Recreational Music-Making, A Cost-Effective Group Interdisciplinary Strategy for Reducing Burnout and Improving Mood States in Long-Term Care Workers," Advances in Mind-Body Medicine, Fall/Winter 2003, Vol. 19 No. 3/4. 2. Winkelman, Michael, Shamanism: The Neural Ecology of Consciousness and Healing. Westport, Conn: Bergin & Garvey; 2000. 3. Bittman, M.D., Barry, "Composite Effects of Group Drumming...," Alternative Therapies in Health and Medicine; Volume 7, No. 1, pp. 38-47; January 2001. 4. Winkelman, Michael, Shamanism: The Neural Ecology of Consciousness and Healing. Westport, Conn: Bergin & Garvey; 2000. 5. Friedman, Robert Lawrence, The Healing Power of the Drum. Reno, NV: White Cliffs; 2000. 6. Mikenas, Edward, "Drums, Not Drugs," Percussive Notes. April 1999:62-63. 7. Diamond, John, The Way of the Pulse - Drumming with Spirit, Enhancement Books, Bloomingdale IL. 1999. 9. Mikenas, Edward, "Drums, Not Drugs," Percussive Notes. April 1999:62-63. 10. Friedman, Robert Lawrence, The Healing Power of the Drum. Reno, NV: White Cliffs; 2000. Michael Drake is a nationally recognized writer, rhythmist, and shamanist. He is the author of The Shamanic Drum: A Guide to Sacred Drumming and I Ching: The Tao of Drumming. Michael's journey into rhythm began under the tutelage of Mongolian shaman Jade Wah'oo Grigori. For the past 15 years he has been facilitating drum circles and workshops nationwide. To learn more, visit Michael's web site at: www.geocities.com/talkingdrumpub.